1) Wash and dry fish well and rub all over with turmeric and salt. 2) Cut each steak into serving pieces. 3) Heat oil in a frying pan and fry the fish until golden brown on both sides. Remove and set aside. 4) Put onion, garlic, ginger and tomato in container of electric blender and blend to a smooth paste. Heat oil in a saucepan and fry the blended ingredients for a few minutes, until oil begins to separate from mixture. 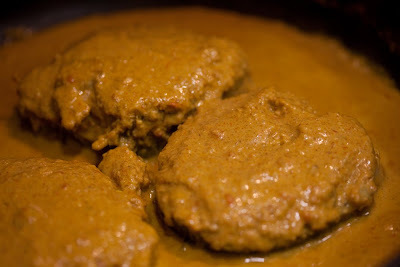 5) Add the curry and chili powders and about a teaspoonful of salt and the coconut milk. Bring to the boil, stirring. Simmer for a few minutes, then add the fish and simmer further for 10 minutes. 6) Serve with rice and accompaniments.